Hello friends! This is my 2nd post for the day. For Simon Says Stamp Wednesday Challenge, please click here. Yes, Altenew has done it again! Along with some awesome scrapbook stamp and dies, There are also a few floral sets (of course!!). Today's blog hop starts from Altenew Scrapbook Blog. If you are coming from Aga (Agnieszka Malyszek) blog, then you are in the right place. 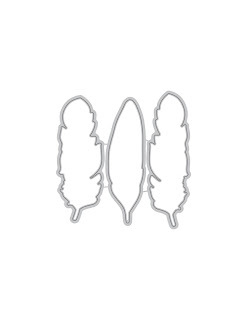 The feather image is detailed and intricate. I only need to do a bit of multi-color stamping and Partial Embossing with Platinum (Altenew, Simon Says Stamp ). Because this release is more geared to Scrapbooking, I thought I need to try it again as a card-maker. All the kiddies featured are NOT my children. However, they are my lovely relatives! The makes it super easy to use the camera stamp. To add some sparkle, I applied some good old Silver Stickles. I stamped all my images with MISTI as it really helps me to do selective/multi-color stamping. I also utilized Grid Stencil (shop Simon Says Stamp here) and Halftone Stamp (shop Simon Says Stamp here)o create a subtle background. 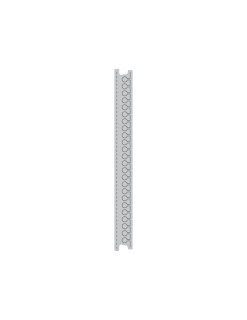 I recommend these useful stamp and stencil as they are perfect to add that extra something in your cards/layouts. This is likely my easiest layout. The sentiment and photo (my nephew's son) say it all...what more can I ask for? Altenew's Our Family Scrapbook Collection really is handy to help me pull all this together. If you know of someone who love scrapbooking but really doesn't have the time, Our Family Scrapbook Collection is really the perfect Christmas gift! Creative Edges: Notebook Die is such a great addition to the layout. I started to stamp a colorful background with the layered flowers. I then decided to use Halftone Hearts Die to create a shaker card. My sequin mix: Sweet 16 and Sunshine . I stamped the card in all my favorite ink collection from Altenew: Rock Collection, Sea Shore Collection and Red Sunset Collection. The "you+me" sentiment was embossed in white on dark grey cardstock. Phew... hope you are still here! What a long post, eh? Your next stop is Kymona Tracey's blog! Prizes: Altenew is giving a way a $50 Gift certificate to SIX lucky winners! 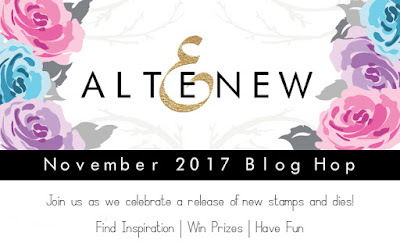 Please leave a comment on Altenew Card Blog and Altenew Scrapbook Blog by Thurs. Nov. 16th. Giveaway: Please be sure to leave me a comment in this very blog post also because I get to give one random winner a $30 Gift Certificate to Altenew Shop. The winner will be announced right here in this blog on Tuesday, Nov. 14th. All of your projects today are awesome! Love the release projects you created.-Maria Giselle B. 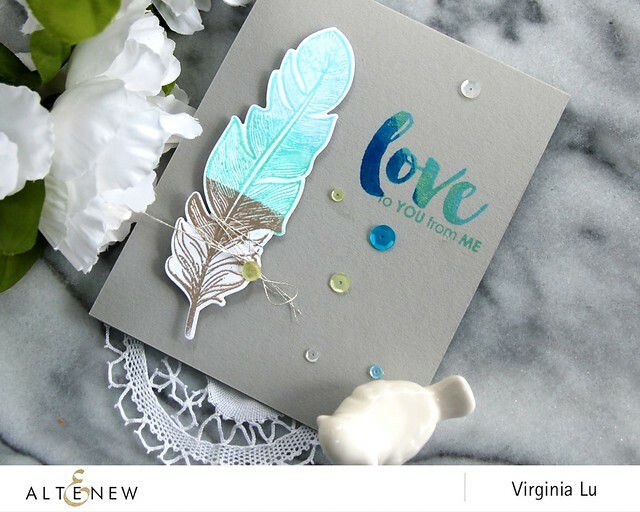 What beautiful use of the new release products, Virginia! Love the cute photos of the little ones, too. Great release, love your projects! Especially the Golden Feather Stamp set! Good grief, this is an amazing release but the best part is seeing your projects. Those scrapbook layouts are wonderful (as are those precious kids). The way you stamped that camera is beautiful. My favorite is your floral card. The the mix of vibrant color with grey tones and making it a shaker just adds to it's awesomeness. I love your photo heavy post! The cute pics of the kids are so precious. I started out scrapping and now do mostly cards but I'm getting inspired to start back with it. Love your work and artistry here! So well done and fun, too! Beautiful projects. Love the creative edges! Gorgeous and delightful scrapbook pages. Your feather cards are very pretty, too. Love those layouts and the cards, too. Loved the use of the notebook die . Simply awesome !! The shaker card is fun . You definitively had fun with the great new products. Great creations! Such fun and amazing projects! Great cards and layouts! Loving the release! Amazing cards and layouts!! I just love the feather card so much!! All fabulous projects and well worth the long post!! It was a long post, but worth it. Lovely cards and layouts! Fun cards; love the Golden Feather set and I love shakers! Awesome layouts. Love how you framed the boy's photo with the notebook edge on both sides. Holy cow, Virginia, you have outdone yourself. I think the scrap pages are wonderful--but--you card made me swoon. Your extended family's children are cuties. beautiful projects!! Adorable children and although I'm not a scrapbooker those are my favorites here today! Terrific projects! Love your feather card... it's a great new set. 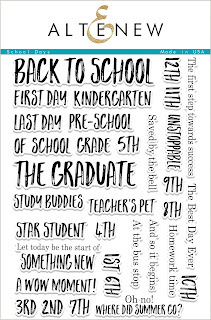 Your 'first-day-of-school' page is precious... you really captured the joy and excitement of the day. Nicely done!!! Great projects!! I love the ombre on the first card, something I have been wanting to try. The scrapbook pages are great! Love the camera and all the elements floating around. The bold blue on the 2nd one stands out perfectly! I love all these awesome projects, Virginia! 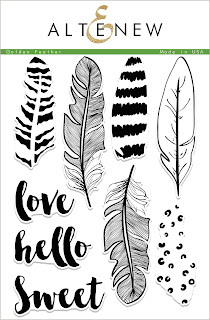 The feather card is my favorite as I adore feathers of all kinds. Your "lovely relatives" are so cute!! Thanks for sharing these beautiful projects Virginia! Very cool projects, love all the designs and techniques you used!!! Love your ideas using the new products, they turned out so beautiful! 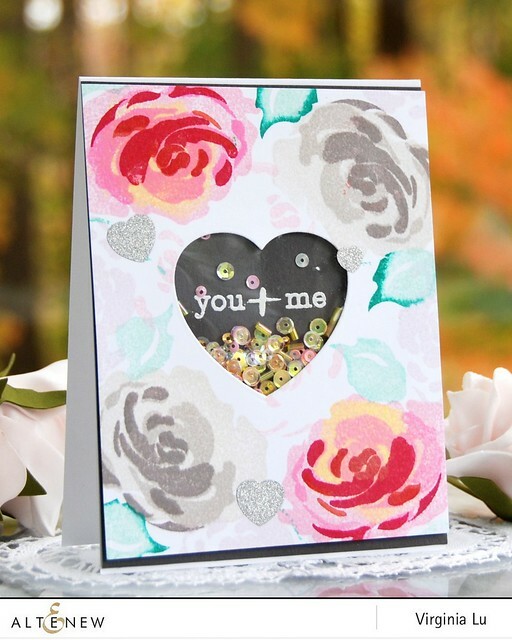 Your creations truly show the versatility of this release for both cardmaking and scrapbooking. Thanks for sharing these great examples of both. I love your shaker card. It's gorgeous! All of your your projects were lovely. Thanks! WOW!! You did a TON of projects!! I Love the scrapbook pages you did. Your cards and layouts are just gorgeous! Thank you for sharing the inspiration! Lovely scrapbook layouts and a beautiful card. Thank you for wonderful examples of this fabulous release! Marvelous inspiration with the new release! aww your layouts caught me by surprise! So sweet and lovely! and your cards are gorgeous as always! Hugs! Haaaaa, warning photo overload.... funny. That's the best warning. Each photo was great!!! Can't wait to continue on this hop. My wish list is groooowing! 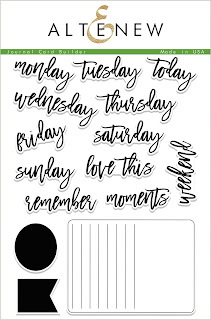 Your cards are beautiful but I especially love how you used stamps on your sweet layouts! That camera image is so fun. I have drawn so much inspiration from your projects, thank you so much. Great cards and pages...very inspirational!!! 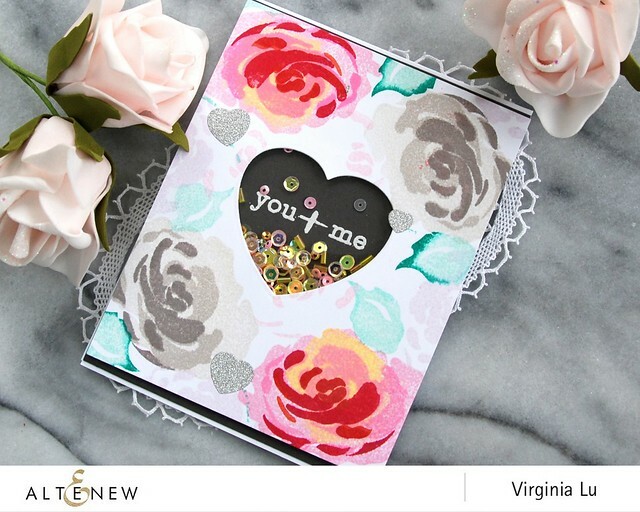 Your cards and scrapbook layouts are delightful, Virginia! Great use of some of the wonderful items in the new Altenew release. Wonderful projects you created with this release. Both your cards and layouts are wonderful! I love the little guy ready for the first day of school! He's such a cutie and your layout with the new products reflects how excited he is! 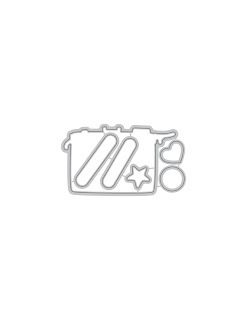 I love all the cards and scrapbook page you made with the new stamps and dies. 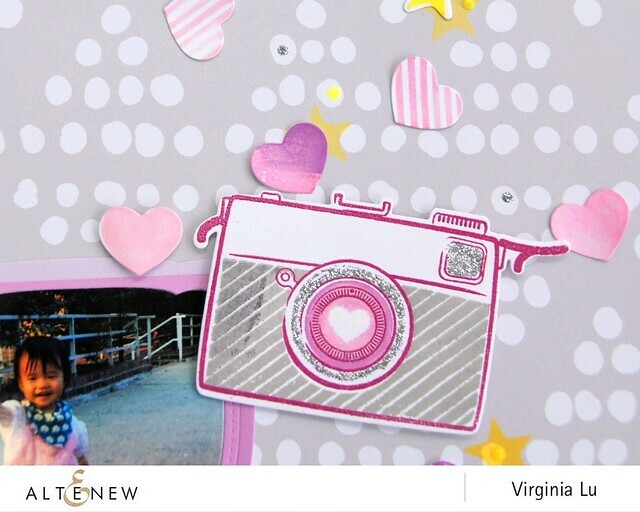 I especially love the Snapshot stamp and die set so it was nice to see you use that on a scrapbook page. Oh my, Virginia! So many projects and so much inspiration! BTW, those are darling little relatives you have too! All of your projects are lovely. You always create such beautiful projects. Thank you for sharing the many different ways to use the new items from this release. Wow, Virginia, you've been busy! I love both of your layouts - they're so fun and sweet. Your cards are both so beautiful, too. I am a scrapbooker too and am glad you showed us some layouts and cards! The kiddos are super cute too :) thanks for the chance to win! Beautiful cards and great layouts! So creative! Love the feather card, your layouts - they really highlight the happiness of the children!, and your beautiful floral shaker card. Great cards, I love the feather stamp card. So many wonderful projects. 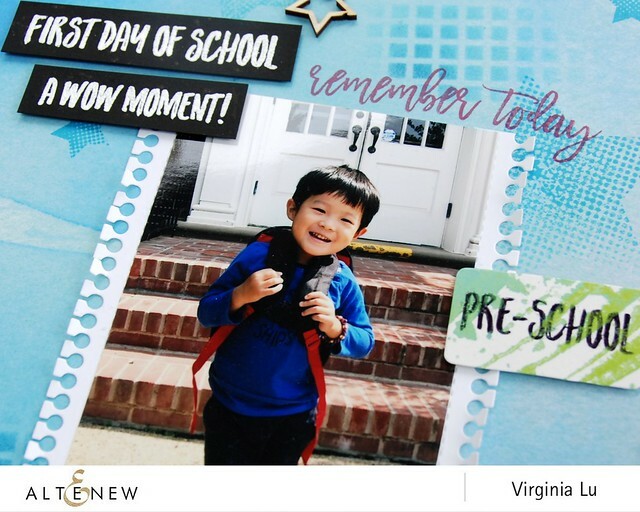 My favorite is the first day of school layout, I can’t resist that smile. SUPER CUTE layouts and BEAUTIFUL cards! They're all wonderful designs ... I especially LOVE the feathers and layered flowers! Beautiful cards and layouts Virginia, TFS:). I'm loving the products in this release, especially the feathers and the notebook die...both of which you used to make stunning art! Great memories for the future. The collection is fabulous and so are your projects. Love the layouts! Wonderful stamps and very creative card designs! your layouts are so great!! All of your cards and layouts are stunning and use the new product well! I am excited to get those feathers! Wow! You really went all-out in giving us options for this release. I love how you did the camera to match the colors of your paper; it's such a beautiful accompaniment to the photo. And that notebook edge just gets better every time I see it; it adds so much! Thank you for some wonderful ideas! Lovely stamps and you made as always something amazing with them. Wonderful projects! Wonderful projects Virginia! 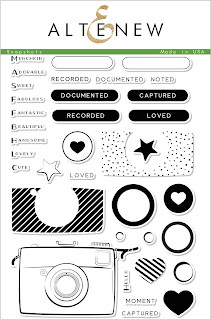 I love to see you scrapbooking and there are some great products for that in this release! Beautiful cards and layouts!! I love that shaker card. The layouts are so cute! great cards and layouts! Love this release! Wonderful projects. They are all beautiful and pleasing to the eye. Great work. I love your posts, so detailed! Your layouts and cards are just beautiful! You are very talented!!! 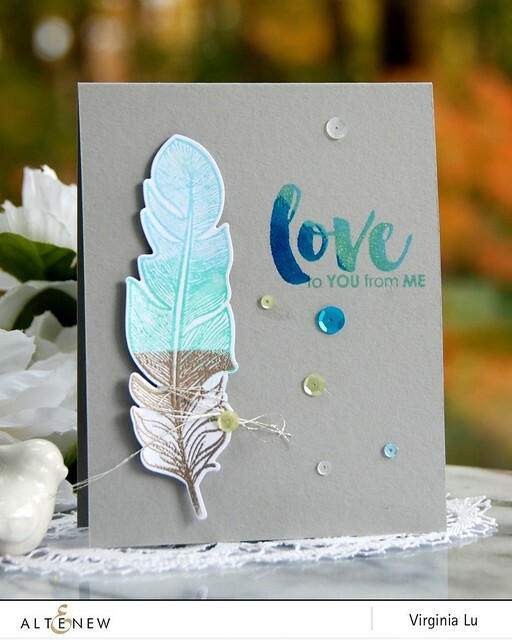 Gosh, you have been busy :-) SO glad you showcased the feathers = I LOVE them, and your card is beautiful! I love the multi-colored effect you did with the feather card! Beautiful cards and layouts! The first card is marvellous! Thank you for sharing these inspiring projects. The feather card is so pretty. You're doing at scrapbooking ! Your layouts are beautiful ! Just as your cards !! WOW,wow, wow!!! So much beautiful eye candy! I love all of your gorgeous creations! how sweet your layout is!!! Your projects are beautiful thanks for sharing. Love the Golden Feather set in this release. Thanks for showing how to make a darling scrapbook project, too. Great layouts and cards. Love the feathers and florals. Great layouts, such cuties. love the cards, thank you for sharing your talents. 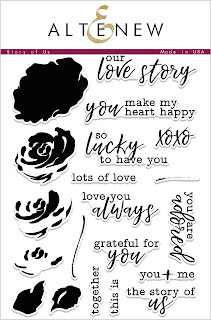 Love your cards and your layouts are fabulous. Cute layouts and I love your shaker card. Use The Glitter Paper and a little Giveaway! Simon Says Stamp Early Bird SALE!